Would you like to wish Hubble a happy birthday? Hubble fans worldwide are being invited to take an interactive journey with Hubble. They can also visit Hubble Site to share the ways the telescope has affected them. Follow the “Messages to Hubble” link to send an e-mail, post a Facebook message, or send a cell phone text message. Fan messages will be stored in the Hubble data archive along with the telescope’s science data. For those who use Twitter, you can follow @HubbleTelescope or post tweets using the Twitter hashtag #hst20. Hubble launched on April 24, 1990. This morning during interviews on NASA TV, Grunsfeld and Weiler said they both felt fortunate to work with Hubble, a telescope who’s legacy will live on, no matter how much longer the telescope operates. “I’m lucky to have worked on a project that will outlive me,” Weiler said. Looking at these images remind you just how small and insignificant we humans are in this universe. Not to mention the unique history which gave birth to us. At only 7500 light years away, it does make you wonder how our little area of the galaxy looked 5 billion years ago. Can’t thank the Hubble team enough for their work. Wow – just WOW! Take a look at the shock front around the end of that Herbig-Haro jet up the top!! Beautiful. What a damn fine image. Beautiful images and an excellent series of articles. BTW. “a telescope who’s legacy will live on” – ‘who’s’ = who is. Try ‘whose’ instead…. For instance, the bipolar jet of HH 901/902 in the top portion of the image measures about 0.61 light-years in length. This annotated image help one to get a better perspective on the scale of the object(s) portrayed. 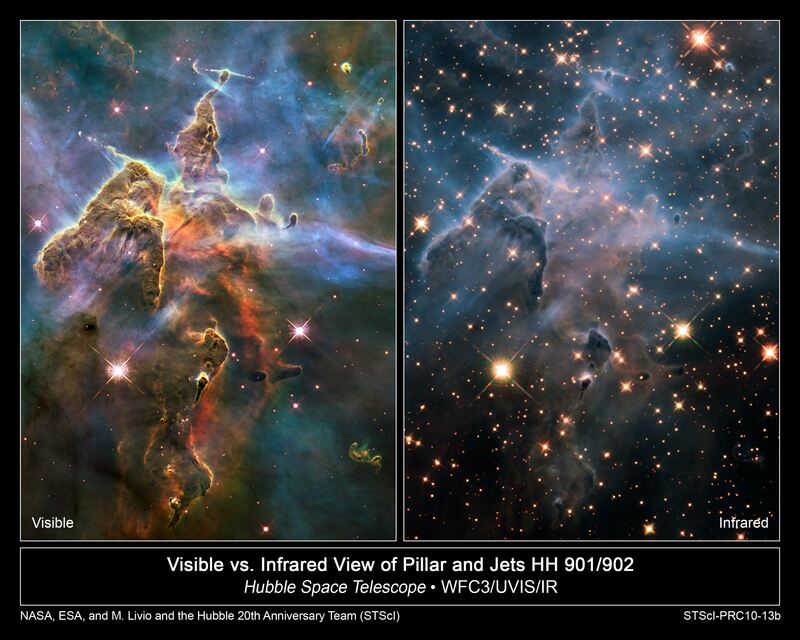 The side-by-side image reminds me just how much we will lose at the end of Hubble’s mission – being that there is no visible-wavelength replacement planned anytime soon (until or even if the ATLAST gets built and launched a couple of decades from now). The ground-based observatories are by now at least equal to Hubble, and with the new E-ELT of ESO the optical part is well covered. There is just no need anymore for optical ‘scopes in space thanks to adaptive optics. There are quite a few things the Hubble, with its current instruments, can do that ground-based facilities can’t today (and some, will never be able to do).